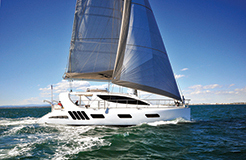 Every year as we prepare our annual boat show preview of new cruising boats we are remined of two important changes that have taken place in the U.S. sailboat market in the last decade: fewer and fewer new boats are being built in North America and, second, multihulls are gaining in popularity at a rapid rate. 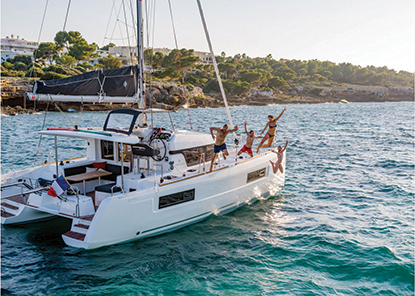 With that in mind, we offer our preview and note that half of the section is devoted to multihulls and half to monohulls. And, we note also that most of the boats of both types that we will be previewing were built in France or Germany. How the tariffs imposed by the current administration in Washington will affect the prices of boats being imported from Europe and other countries remains to be seen. But, as you are looking at new boats this fall, be sure to factor tariffs or potential tariffs into your calculations. 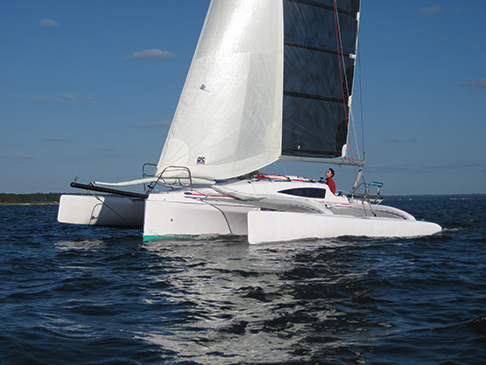 The newest boat designed for the French offshore sailing event known as the Figaro, the Beneteau Fiagro 35 brings foiling technology to the production boat market. The boat has two inward facing foils that can be retracted against the sides of the boat or deployed for high sped sailing. 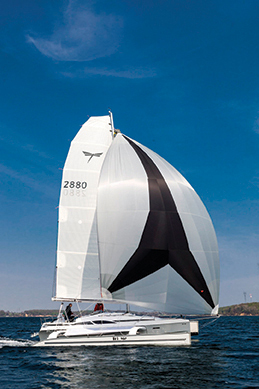 The foil on the leeward side provides lift and increases the boat’s righting moment considerably, which therefore allows it to carry a larger press of sail. All of this translates into very high speeds. The concept has been proven in the designs of the IMOCA 60s that race around the world in the Vendee Globe Race but the foils used in the Figaro are different and less extreme. Not a boat for casual coastal cruising, instead the Beneteau Figaro 35 is a pure performance machine that will supply plenty of high speed thrills. 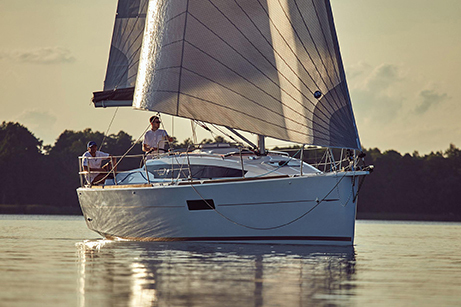 The Slovenian builder Elan has two basic lines of boats, the high-performance GT designs, and the roomier, more commodious Impression line. 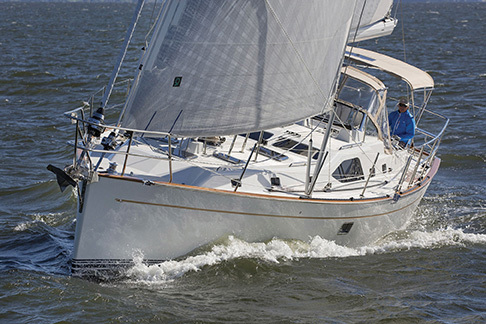 The Impression 45, is the largest boat they build and it is a modern Rob Humphries design that offers excellent sailing performance with a rig that is easy for a couple to handle. The cockpit is large but not too large, the interior is roomy yet it feels more traditional than some of the other boats in this category. 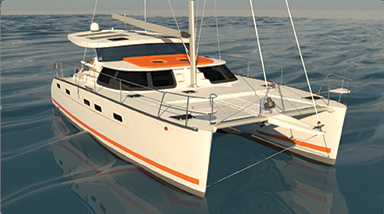 The i45 can have two master staterooms with en suite heads, or the standard three-cabin two head version, or it can even have four individual cabins. 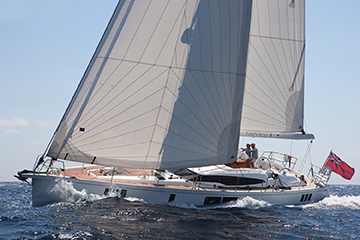 Although not well known in the U.S., Elan has been building quality sailboats for 30 years and is well respected around the world. 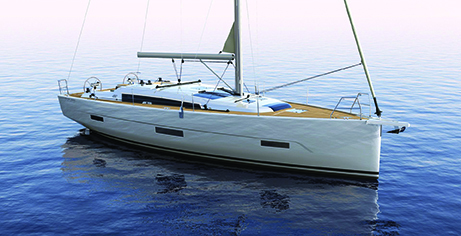 www.elan-yachts.com. 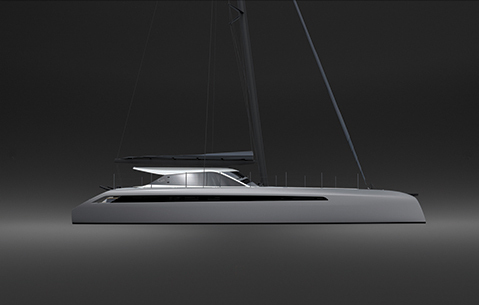 Garcia Yachts is a French boat building company that specializes in aluminum construction. They build the Garcia line of yachts but they also build large commercial vessels, expedition ships and large custom aluminum yachts. 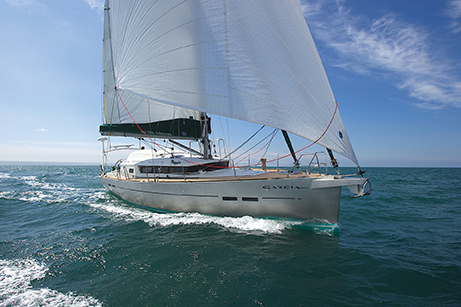 The Garcia Exploration 45 was developed with Jimmy Cornell to be a rugged, fast, comfortable cruiser that would be well suited to high latitude sailing in the Arctic and Antarctic. The aluminum hull is incredibly strong and capable of serious groundings and collisions with ice. 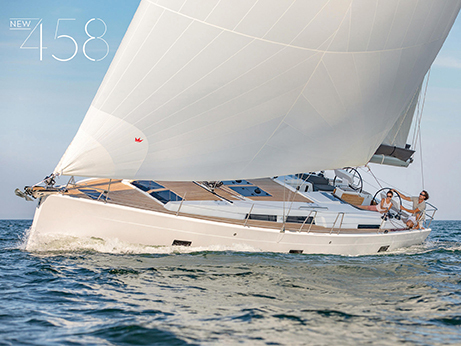 The 45 has a centerboard that can be retracted for negotiating shallows or lowered when sailing in deep water. The interior is warm and traditional and set up so you can operate the boat from the warmth of the cabin. 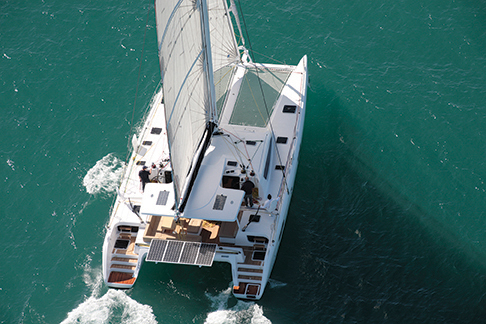 If you are headed on a cruise to the farthest reaches of the planet, the Garcia Exploration 45 is the boat for you. 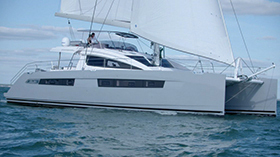 www.garcia-yachting.com. 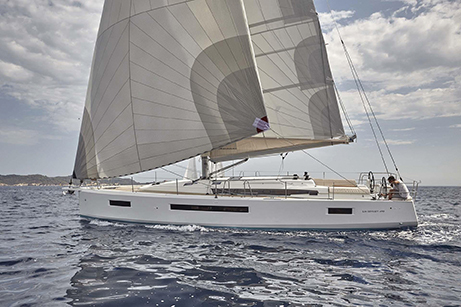 Built in Germany, Hanse Yachts offers a full line of performance cruisers that are noted for their great sailing characteristics, comfortable cockpits, easy self-tacking rigs and huge interior spaces. You often feel like you are on a boat five feet longer when you climb down the companionway of a Hanse. 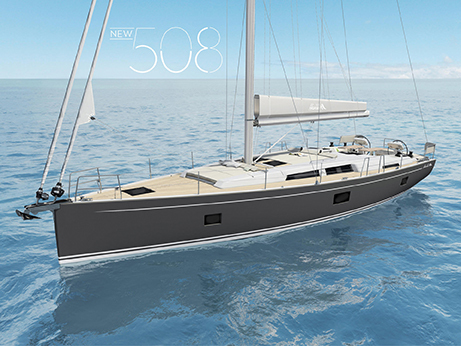 The new 458 falls right in the middle of the Hanse range and is designed for a couple or a cruising family. The cockpit is large and the twin wheels both have excellent visibility forward. The transom folds down to make a large platform. Down below the saloon has a dinette forward with a settee across from it and the L-shaped galley aft. 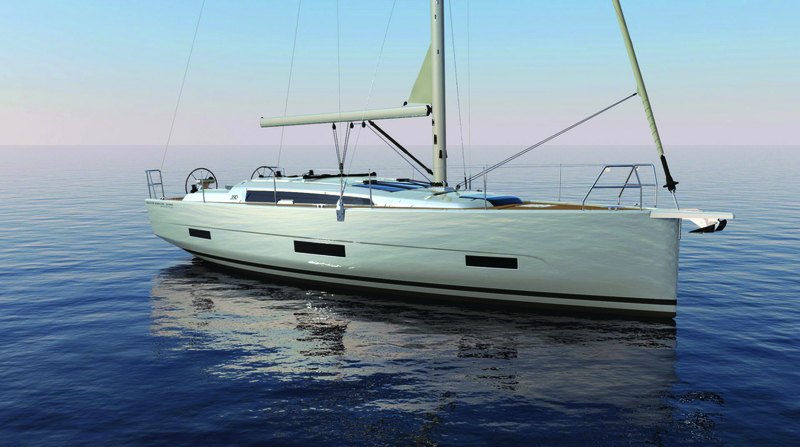 The standard 458 has three sleeping cabins but the forward cabin can be split into two cabins as an option. 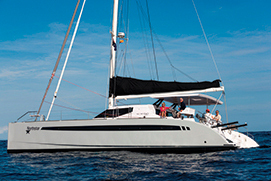 Jeanneau, which is a part of Group Beneteau, is now the second largest builder selling boats in the U.S. after Beneteau itself. 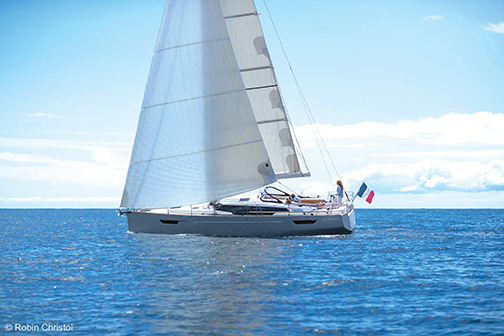 Some of their boats are built in the Beneteau factory in South Carolina while the larger boats are imported from France. 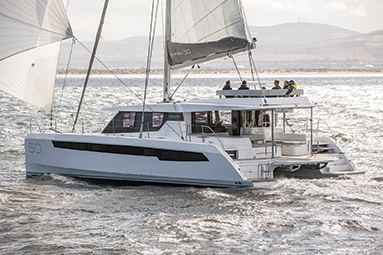 Last fall Jeanneau introduced the all new 440 which is chock-a-block full of innovations, including the walk-around side decks that join the cockpit floor with the decks. 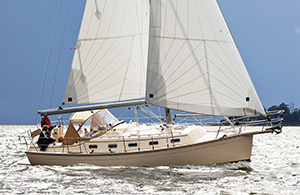 The 440 was the first in the eighth generation of Sun Odyssey cruising sloops. The 490 is the 440’s big sister and offers all of the innovations in the smaller boat in a much larger package. 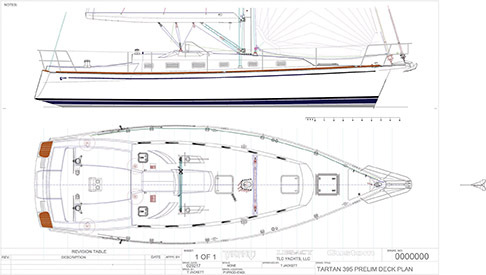 Both boats have three-cabin layouts and spacious, well laid out saloons. 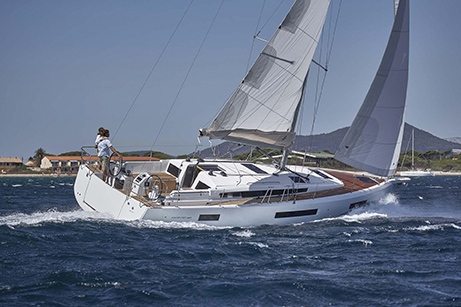 And both boats embody Jeanneau’s reputation for delivering great sailing cruising boats that are modern and somewhat traditional at the same time. 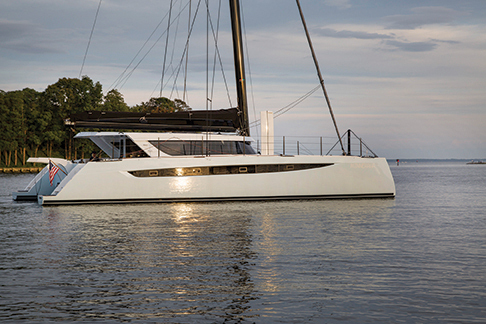 The new wave of catamarans sweeping the market is definitely the new power cats that are being brought out by the big builders. Last year FP launched their first 44 PC to rave reviews. 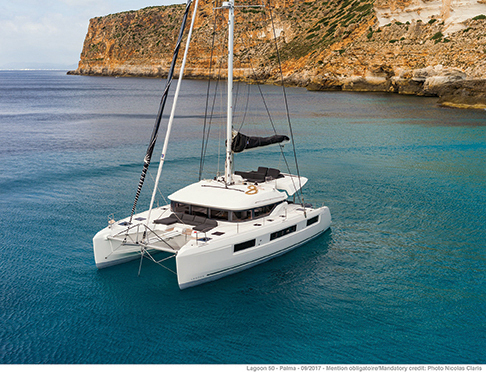 The design won the European Boat of the Year Award in the power catamaran category and has been a huge success with dealers. 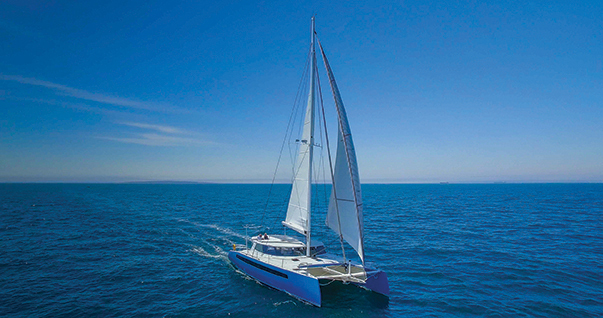 The 44 has all of the benefits of a large cruising cat – huge living spaces, stable platform, great maneuverability, lots of room for guests and more – without the addition of a mast and sails. Cruising power cats are also very economical as they can be pushed along with smaller engines than an equivalent monohull and can be run on one engine at a time. Next year, FP will bring out a 40 PC that promises to fit a lot of budgets. 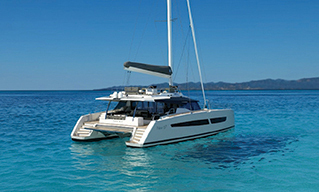 www.motoryachts-fountaine-pajot.com.